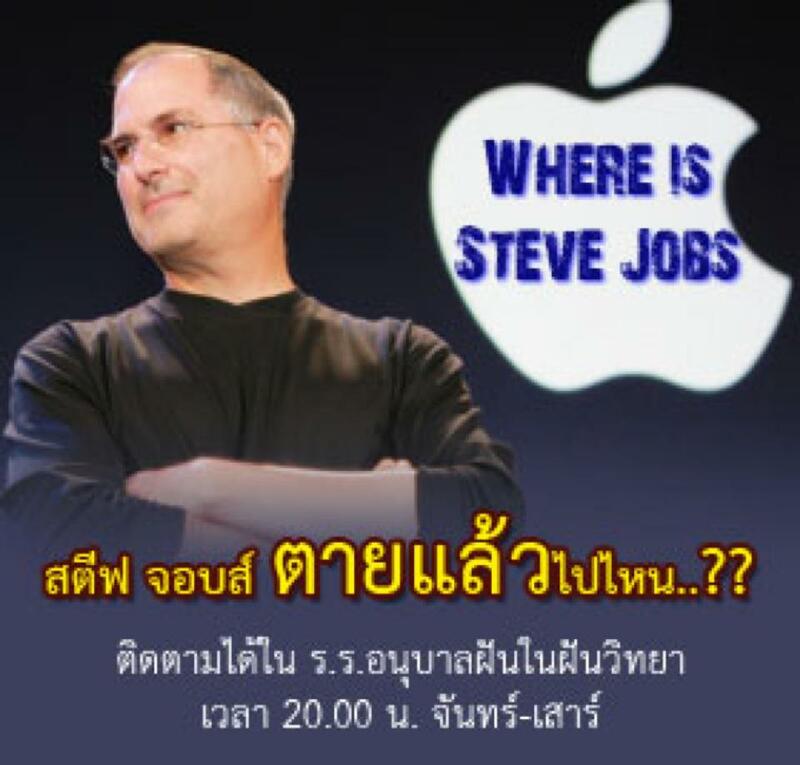 Where is Steve Jobs Part 2? Last week it was announced that our Abbot would be going over the Case Study of Steve Jobs which was submitted to him many months ago. When I first found out that the Abbot has received a submission to talk about Steve Jobs Case Study I was very curios to find out what the Abbot would reveal. I told our class this many months ago, from hearing it myself through the grapevine from one of our Dhammakaya members. And now, finally, after many months I came across an image that I couldn’t read. I sent it over to a dhammakaya meditation members that I am friends with, we’ll call him Richard K and he confirmed to me that sure enough the Venerable would be speaking about Steve Jobs Case Study to be presented on August 17th, August 18th, and August 20th during our Abbot’s show, Dream Kindergarten Dream. This is a show that airs everyday on the DMC channel, where people from around the world who believe in reincarnation and the high level meditation of our Abbot, submit various questions that afflict their lives. Often times after cases are explained there definitely seems to be some sort-of parallel connection that makes perfect sense. Like the Case Study that we watched in class many weeks ago, about a little girl the age of 10 years old, who wrote the Abbot asking what her Karma was to be born in this life, but look like an old lady the age of 60. To summarize it the Venerable mentioned that in a previous life she was influenced by her mother to be rude and hurtful to her grandmother, later when her father passed away, they (her mother and her) cause a lot of suffering and sadness to her grandmother to the point where she passed away, she would always tease her grandmother “you old lady, you old hag” so in this life she is a little girl, who looks 60. Hmmmm well that is possible?! And makes sense nothing you can prove, but I would hope things have a reason for happening to others and its not “just because” it just makes sense to me as a human being. So therein lies one case study that I have listened to. However Steve Jobs Case Study had been in the works for many months. When I found out about the Venerable planning to answer questions written to him, I was itching to get my hands on the material. I called the staff person at the Georgia Dhammakaya Meditation Center and asked her to record the information for me, figured she would have direct access to resources. However getting the information over to me quickly enough, was not happening and I wanted to present the materials on August 22nd, so with that I buzz in different directions doing plenty of research and downloading until I was somehow able to get all the videos aired. It took many hours. When I finally watched the material, I knew it was just too long, each episode was about an hour long, with that I decided the best way to present the material, since most of it was in Thai, was work on translating it and presenting it myself. I honestly did try to figure out the most efficient way where I didn’t have to do it, but in the end with being crunch for time, since I put a deadline for myself, it had to be me. With that and the timing of when I received all the videos, I was crunched to meet my deadline. I ended up figuring out how to record my voice on the computer and did it in one shot! This is it! In the end when the class watched it yesterday, I can’t lie that I was proud to create something that I was able to share with others. It gave my mind happiness to know that I was helping to spread the teachings of the law of karma, in my own little way. The Venerable always tells us before going over a case, to listen to the answers like it’s a fairytale, do not believe it, do not disbelieve it, but if you can gain some wisdom in the stories, than you have benefited. So here is my work. I created this video so that I can share it with our weekly meditation class, and anything more than 30 minutes wouldn’t work for us since our dhamma portion of the class is allotted 30 minutes, that is why this video worked out really well at 20 minutes. We generally try to start the class with some sort-of inspiration before our guided meditation, either an inspirational quote, a teaching, a parody. On August 15th I tried a little something different. I guide our meditation class about once a month. It was my turn, we had about 15 people in class that day and I was trying to set the tone. I showed Video 1 right before we meditated, I felt that this video could help create spaciousness and happiness from the mind. Imagine how awesome it would be to watch scenes of Video 1 on IMAX and to feel engulf and a part of the world, as if you and the world/universe are one. In a lot ways that is exactly what we are trying to achieve when we meditate. Our meditation session lasted for about 40 minutes. It is always such a powerful experience to meditate in a group, having others around helps to encourage the time you devote to meditation, otherwise it is very easy to spoil yourself and stop when you feel like it. There is nothing better than creating merit (pure energy) with others! When we were done I showed another video (Video 2)...again along with the theme of the day which is "The World as One" this video actually shows you the bigger picture of life. I truly try to help people think bigger! Think farther! Think different! Realize that you don't have all the answers and there is probably a lot of things that we JUST don't know, it goes beyond what we think we know. So be OPEN to the possibilities to go beyond the frontier, kind-of like Star Trek. I hope that this is what the class was able to take away after seeing Video 2 that we are all in this game-of-life together we truly are one, there is no ego when you see the vastness of our universe, there must be something more something beyond what makes sense to us so lets try to meditate and connect to the Universe and find the Stargate within us! Our Venerable NaLong, when he is guiding likes to remind us that we have a Stargate within us and for us to meditate and we will see. The last video we watched was the icing on the cake! Why because it was the connection between Buddhism and what the definition of the World Means. Excellent material indeed, this is the stuff that truly is a meal for the mind. I haven't had a chance to load the video online yet, but I plan to, basically Venerable Nicholas, a top Venerable at our Dhammakaya Foundation, who is very knowledgeable on Buddhist concepts, and is a great dhamma teacher. He explained the world in 3 levels the environment level, the lifestyle level, and the level of the mind. When we talk about world, one meaning of the word is the environment around us this, level of world is anything outside of our skin outward, location is an example this is the world on the most distant level, within this sometimes we come across pollution or destructive weather it is a blight of level of environment. This is the world on the largest level the natural environment and problems such as pollution. One step further in is the world of our own lifestyle, on this level our connection with the world is also like a world of our own. It's an individual world, as a result of managing our own world if we do our duties properly than more than likely we'll be rewarded properly, however if we do not do our duties it can be hard for us to get by.So blights in your indivividual life. So if you are immoral than you might go to jail. Another meaning of word world it is the level of the mental qualities this is the world which is private world of our own other people do not know about it, but within us we will probably know it very well. Most people who do not meditate do not know much about this level of individual world at all, because they have never seen their own minds and they do not yet understand the concept of good or bad quality of mind. Some people, for example who are cheerful all the time no matter what, they have a very good outlook of the world and are optimist. Even if they do not meditate but they have a certain level of quality of mind that it is hard to push them down, this is rather the thing that comes with meditation practice as well. As you meditate more, it is easier for your mind to not let defilments interfere with their mind. People who have dellusion it may cause them to treat the world in a way that is bad for other people, which in turn is bad for themselves. What we call the world is interplay of three diff levels of reality. In Buddhism we say what goes on in our mind, the qualities of the mind, the defilments of our mind is an imporatnt factor. More importnat than the rubbision the enviromment we make a connection it goes deeper to the root cause which lies within the mind. In Buddhist we say who threw the rubbish in the first place then to treat environment with such disrespect. Shows quality of your mind, how quality of life can deterorite and if life detoriates then enviornment detorieats. Then we see how we behave is such an important factor, not just chainging ourself but everything in the world. We believe that we can change the world by chaning the root cuase which is within ourselves. This creats a vibration which will spread to other people. Why are we here, why we give time to mental practice it is not just on small individual level it has ramifications that extend further than that. Venerable Hart showed us a video of Nick Vujicic I had never seen the video nor have I ever known of him and I couldn’t help but get a little emotional after watching the video. It truly was inspiring. Before watching this video the Venerable asked the group if there are times in life where you feel discouraged, depressed, or that there is no light at the end of the tunnel? Of course everyone has had times like this before and we can all relate. The Venerable said watch this video and it will inspire you to be happy. He was right! After I saw the video I couldn’t help but realize how we all have obstacles to face in our lives, but you have a choice to be happy and the truest form of happiness is the one that you find inside of yourself when your mind is still. It is the only form of happiness that brings you true wisdom to deal with all the difficulties that we face. After the video was presented to the group the Venerable reflected on the teachings of the Buddha he mentioned that in our existence we have been brothers, sisters, mothers, fathers, handicapped, royalty, peasants, rich, etc countless number of times already and counting the cycle of each of our existence is incalculable and numerous. We are born in this lifetime as a human being, we should use our human form to pursue perfections, we need to use our time to meditate and accumulate good deeds. To realize that life isn’t easy, see the suffering and impermanence of life not as something that is depressing, but something that is true and real, to see the wisdom in this and start trying to live your life towards virtue and doing good deeds by purifying the mind through meditation, by cultivating good deeds, and by upholding precepts and conduct your life morally. Buddhist from all Faiths Welcome! Alms Offering for Monks before Rains Retreat. Buddhist from all faiths welcome! Asarnhapucha is the day the Buddha gave the first sermon "Dhammakacaccavattana Sutta" to the five ascetics at the deer park. It signifies the completeness of the Triple Gems in Buddhism. The Buddhist lent is the three months period during the rainy season that Buddhist monks retreat themselves into Dhamma study and meditation practice in their monasteries and refrain from travelling. After the completion of the rains retreat monks receive new robes from the lay community, called the Kathina Ceremony, or robe offering ceremony. The Kathina ceremony marks the end of the rains retreat; this ceremony is over 2600 years old. During the robe offering ceremony robes are presented to monks who have completed their 3 months rains retreat period. Keep in mind that every Buddhist center has their own Kathina ceremony and the actual date varies depending on when Buddhist Lent officially starts for each individual center. Please join us to initiate this auspicious period for the monks at the Dhammakaya Georgia Meditation Center this Sunday August 5th. The schedule for Sunday Service Alms Bowl offering is below, feel free to come at any time that is convenient for you, but I would recommend to come before the alms offering portion of the day, which is where lay people offer food to the monks and there is always plenty of food prepared by many to offer to the Venerables, so please join us! Every Wednesday we come together in a group environment at the Georgia Meditation Center to meditate and with each class I hope that there is a piece of wisdom that our members gain. I believe that we are sitting on a mound of spiritual treasures; however I don’t know how many people see it. I would have to guess that our meditation members who come consistently know this J we also have members that come one time and we never see them. If anything our GMC team can definitely smile because within the 5 years of us consistently meeting to meditate every Wednesday we have touched upon at least 1200 people in giving them the tool to inner peace through meditation. With that I hope you enjoy the next piece of wisdom that we learned the other day in class. Note: Generally before our guided meditation, a meditation member will read out loud a quote or lecture written by our teachers, either our Abbot, Venerable Dhammajayo, or our Master Nun, Khun Yay, which helps inspire us to pursue virtues in our journey of inner happiness and peace. The other day we skipped this portion of class and instead a parable was read. A man raised fighting fish to earn a living. His fighting fish were widely known for their beautiful colors. Anytime, he sent them for a contest, he won the prize. Someone observed that his fish displayed not only the beautiful colors of blue, green, purple, and red, but also less common colors such as light lavender, pink, and gold. People frequently asked him where he got these kinds of fish or how he bred such beautiful fighting fish. He said that he had not brought the fish from anywhere, but that he had a simple method for developing the breed. He asked an artist to draw pictures of fighting fish and paint the colors as he wanted them to be. Then, he placed the drawings near female fighting fish for them to see. These female fighting fish looked at the pretty fighting fish drawings everyday. When these female fighting fish gave bi1th, one portion of the babies amazingly had beautiful colors as he wanted. Though he did not possess any knowledge of breeding techniques, he successfully developed a new fish breed by systematically influencing the minds of his fish. This parable demonstrates that if the mind perceives good things; it will result in good powers or creative powers that generate good results. For example, the female fighting fish were familiar with colorful pictures which had been recorded in their minds. Ultimately, the mind controlled the physical body by enabling the body to reproduce in accordance with a mental image. Our minds are similar. What happens to us is a result of the accumulated images in our minds. Thus, we should choose to keep only good situations, people and emotions in our minds to support our meditation. What a great way to inspire people to turn on a different channel to what you input into your mind. I remember, Venerable Payungsak, who came to visit our center a few years ago. He compared the mind as a tv frequency and for you to turn on the channel that you want, you are in control if you want to generate good feelings, tune it into a good channel, if you want to generate feelings of sadness well then watch something sad or unjust and the mind follows the emotions. So there you go! I truly believe we have to tune ourselves into a good channel, and try to discourage anything bad because it plants a bad seed in our mind. When I see a movie and there is a lot of gruesome killing, it truly makes me sick and distraught, so therefore I try not to watch anything like that; the problem is these days there is so much violence in television and the media, but one must try when we know about tuning your channels to the right waves…right? For the dhamma portion of class we watched a documentary on the life of Venerable Sodh, the founder of the Dhammakaya technique. Check back on this blog and when I load it I will update on this page if you have any interest in watching it.